Searching for the perfect driveway gates in Manchester? 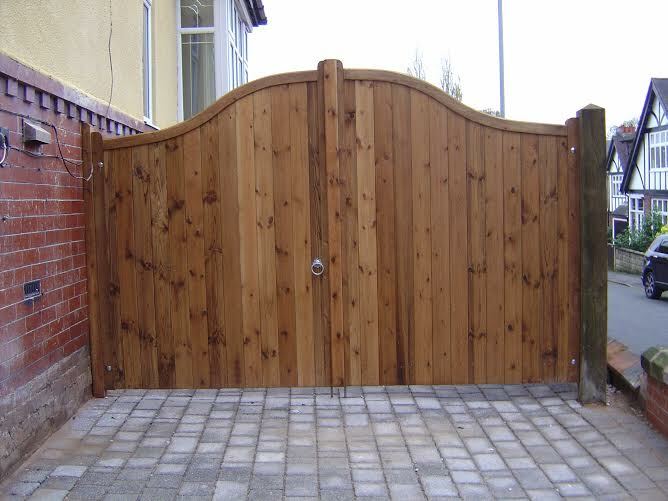 Here at B&K Timber we provide bespoke wooden driveway gates throughout the area! Finding the right gate can be tricky; it must look great whilst also satisfying your security requirements, and so we stock many different styles for you to choose from. You can browse through our range of driveway gates online to find one that you love! Our driveway gates are available in three shades of spirit based wood preservative, brown, red cedar and clear (this will look untreated). Once you’ve decided on your driveway gate, you’ll then need to measure the space in which it will fit. We have a handy measuring guide, to make this process simple, but if you have any questions please don’t hesitate in contacting a member of our team. We also have two sizes of hooks and band fixing kits for driveway gates dependant on the size of gate you’re going for. Our driveway gates are made to your specifications to ensure that they fit in the driveway of your Manchester property perfectly. We have a team of expert craftsman create our driveway gates from the very finest PEFC & FSC certified Scandinavian slow grown, joinery graded redwood timber. We then use traditional mortise and tenon joint to give further strength and durability. We’ve been providing bespoke gates for over 30 years and pride ourselves on the exceptional quality of our joinery. Our great prices are combined with with free delivery of driveway gates in Manchester to give you an incredible deal. You can browse our driveway gates online, but if you have any questions please don’t hesitate in contacting a member of our team. Finding driveway gates in Manchester, Cheshire and Staffordshire has never been easier!